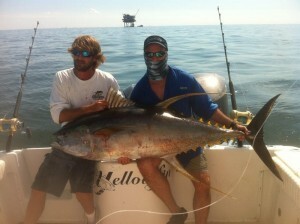 Welcome to Champion Charters, Venice Louisiana Fishing Charters – The Tuna Capital Of The World! We are a venice fishing charters company located in Venice Louisiana specializing in Tuna Fishing Trips and are here to meet all your Louisiana Fishing needs! We offer deep sea fishing like no other in that we target tuna all year long. Our goal is to bring you to the fish are and insure you have a great time catching them. We are focused on providing high-quality service and customer satisfaction – we will do everything we can to meet your expectations. No gimmicks, no excuses…plain and simple…you want to catch fish! We do too!!! We offer custom planned Venice fishing trips, with Venice fishing charters ranging from six to twenty four hours. Everything you need to fish is supplied. Whether you’re looking for a venice fishing boat to fish with family and friends, or a business trip for clients or employees, we will assure you a great trip. Venice, La. 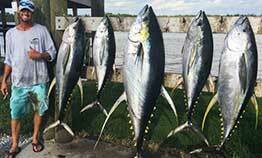 is home to the finest tuna fishing grounds in the Gulf of Mexico. It is no wonder that clients fly from all over the world to fish with us. If you are looking for a thrill in blue water, you have come to the right place. Our priority year round is to put your on trophy Yellowfin Tuna, what Venice is known for. We do get other species while fishing for tuna such as Marlin, Dolphin, Wahoo, Amberjack, Grouper Red Snapper, Cobia, and Swordfish. Between the Mississippi river currents forming thick, fish producing rip lines and the hundreds of oil platforms located in Louisiana waters, my opinion is Venice is the best place in the world to offshore fish. We are named Tuna capital of the world for a good reason and every day of the year you have the opportunity to catch trophy yellowfin tuna. With over 20 years experience in Venice Louisiana fishing, we don’t catch fish on luck or by chance. Through the study of tides, currents, years of logs and captains intuition, we continually put our customers on some of the biggest yellowfin tuna and we do it VERY consistently. Just check out our Tuna Photo Gallery. 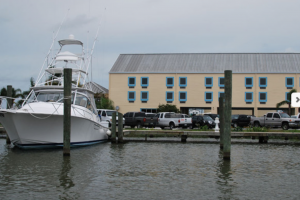 Venice is a beautiful small fishing town that is home to the some of the best fishing the Gulf of Mexico has to offer. Many of our clients come from all over the world to fish with us, however the majority of our clients are from the United States as we are an easy drive or quick flight from areas like Texas, Florida, New Orleans and many more. We always recommend you use the local lodging here in Venice to get the full experience of Venice Fishing Charters. The local lodges are beautiful and you will be just steps away from our dock in the morning. Bring your freshly caught tuna to the local restaurant here at our marina and enjoy fish stories with your family and friends. You’ll be impressed with the lifestyle and relaxed atmosphere that Venice, La. offers anglers and guests.